“Welcome honored donors,” read the banner hanging over the passport control counter at Benazir Bhutto Airport in Islamabad. That, along with hot, musty air, was my greeting to Pakistan, at 3AM two Sundays ago. I had arrived, along with my colleagues Phil Auerswald and Sara Shroff to assess Pakistan’s entrepreneurial landscape. Not far from the banner, there also hung a framed black and white photo of a gaunt man in a dark textured and triangular hat, similar to the one that Afghan President Hamid Karzai sports. It was Muhammad Ali Jinnah, the revered founder of Pakistan – the land of the pure. Jinnah established the republic in 1947, after gaining independence from the British and breaking from India. Jinnah reappeared a half hour later when I entered the lobby of the infamous Marriott Islamabad. He was there again the next day when we visited the Institute of Business Administration in Karachi. Jinnah seemed to be everywhere. The only other place I know of where that happens is… Turkey. The image of Mustafa Kemal Ataturk, the blue-eyed founder of Turkey, is, like Jinnah’s, ubiquitous throughout Anatolia. Both dominate every government office, school entranceway and public space. Pakistan and Turkey have a lot in common. As predominately Muslim nations, both have struggled with secularism and Islam. Both have had, as a result, numerous military interventions that have overthrown their respective country’s government. As predominately agrarian societies, Pakistan and Turkey have wrestled with developing their respective economies in order to compete on the global marketplace. For a long time, it was a tough fight. Both countries choked under unemployment, debt, run away inflation and rent seekers. Pakistan still does. Turkey has broken from that cycle. It broke as a result of the economic liberalization reforms enacted by late Prime Minister Turgut Ozal in the 1980s. With less state-control and relaxed trade and banking laws, Turks embraced entrepreneurship. Overnight, they turned Anatolian cities, more commonly known as “Anatolian tigers,” into textile and manufacturing centers and lifted Turkey’s poor into the middle and upper class. Today, Turkey holds a seat at the G20 and the UN Security Council. Despite being continually rejected by Brussels, it has, by the European Commission’s own account, the fastest (and perhaps only) growing economy. It is an example that beleaguered Pakistan can and should replicate. It should do so with Turkey’s guidance. Turkey understands Pakistan’s economic struggles because Turkey once endured them as well. “We have common problems and common solutions,” said Turkish Prime Minister Recep Tayyip Erdogan while visiting Pakistan just last week. Part of Turkey’s solution is taken directly from Washington in the form of aid. *Sigh. * Fortunately, the other part of Turkey’s solution is precisely what Pakistan will help Pakistan develop: investments. Rather than a money problem, Pakistan suffers from an investment problem. The money that Pakistanis possess is caged. It’s used to cover day-to-day expenses rather than being used as leverage to create new enterprises and, most importantly, jobs. Turkey has discussed opening banks in Pakistan, increasing trade and encouraging its private sector to seek collaboration on construction, infrastructure, engineering, energy, agriculture, telecom and textile opportunities. That is a good start. But more can be done. From a historical, religious and cultural perspective, Turkish entrepreneurs and investors are ideal role models and mentors for aspiring Pakistanis with start-up ideas. They can help advise on operating in a Muslim society where entrepreneurship has not traditionally been encouraged or possible, where risk has largely been absent and where failure has always been the kiss of death. Both countries could develop an entrepreneurship exchange and mentoring program where Pakistani entrepreneurs spend time working in Turkey and Turkish entrepreneurs in Pakistan. Turkish investors could establish, along with their Pakistani counterparts, a fund, with manageable interest rates and transaction fees, for Pakistani entrepreneurs. It is an idea that American venture capitalists would benefit joining as well. This will help unshackle Pakistan’s paralyzed capital that can then provide the leverage to jumpstart enterprise development and job creation. It is imperative that Pakistan climb out of its current crisis and into prosperity. There are signs it is prepared to do so. The absence of Jinnah’s photo in the sleek and modern offices of the several entrepreneurs Phil, Sara and I met with was the clearest. Pakistan’s younger generation, while deeply patriotic, is not straightjacketed by the past. They know that while Jinnah may have been their country’s founder, they are its keepers. For now, they’re pushing their black and white past aside in order to keep their focus on what could be Pakistan’s abundantly colorful and high-definition future. The projections are staggering: 335 million people by 2050, with more than 80 million to be added in just the next 20 years. And if current fertility rates remain constant, there could be nearly 460 million people in Pakistan by 2050. The combination of soaring population growth, youthful demographics (two-thirds of the country is less than 30 years old), a deeply troubled education system, high unemployment, and poor economic performance poses major risks for Pakistan today and in the decades ahead. Predictably, debates about Pakistan’s demographics often assume the worst. There is talk of the country’s nonrenewable resources being exhausted by mass demand; of an already-overburdened healthcare system collapsing under the strain of too many sick and infirm; and of millions of poor, unemployed youth succumbing to militancy. Invariably, such debates invoke the “population bomb” metaphor . The unstated assumption is that the fuse has already been lit, that this bomb will definitely be exploding, and that we had all better watch out. However, this assumption is rarely contested—which is a surprise, given that with sufficient time, tools, and access, any bomb can be defused. And demographers are now starting to believe that Pakistan’s population bomb may indeed be defusable. The message emerging from population experts is this: If Pakistan’s young population can be sufficiently educated and successfully integrated into the labor force, then the country could attain a “demographic dividend” that produces widespread social well-being and economic growth. When confronted with the charge that such a message represents pure starry-eyed idealism, demographers offer this response: A country’s age structure really can help determine economic success. When the majority of a population is of working age, the population produces more than it consumes, while a minority of the population (consisting of non-working dependent children and the elderly) consumes more than it produces. As a result, fewer investments are needed to meet the needs of dependent age groups, and resources can be released for economic development and family welfare. On a more tangible level, this would mean that Pakistan’s key sectors—from textiles and IT to retail and construction—would enjoy an immense infusion of labor. To be sure, attaining such an outcome will be an enormous challenge in Pakistan. Not only will birth rates need to fall, but education and economic conditions will need to be sound enough for droves of young people to be absorbed into the workforce. In a nation where less than 30 out of 70 million children between ages 5 and 19 attend school, and where GDP growth has plummeted below 3 percent in the last year or so, “challenge” may be an understatement. Still, all is not lost. Population experts estimate that Pakistan has a “demographic window” measuring not in days or weeks, but years—30 to 40 of them. The country therefore has several decades to pass the necessary reforms and to institute the requisite policies to turn Pakistan’s demographic situation into an opportunity and eventually a boon. So even while acknowledging the great magnitude of Pakistan’s population challenge, it is equally important to recognize that the country’s demographic situation is not all about doomsday scenarios. In much of the international media, as well as in Washington policy debates, there is a frequent tendency to see only the bad in Pakistan—to fixate on the worst-case and to ignore the positives, whether actual or potential. In an effort to move beyond this reductive optic, the Woodrow Wilson Center will be hosting a conference on June 9 [see her for event information] that examines Pakistan’s demographics not from a when-does-the-bomb-explode angle, but instead from a what-if-any-steps-can-be-taken-to-put-the-bomb-out perspective. The event will examine the salient challenges—youth radicalization, reproductive health, educational deficiencies, and economic problems—but will also consider what strategies can realistically be implemented to tackle the challenges. Pakistan’s demographic realities are indeed gloomy, and the figures alarming. Yet instead of simply provoking fear and resignation, they can also serve as a wake-up call. And for this to happen, Pakistan’s population situation must be recognized for what it is: a challenge that is considerable, yet by no means insurmountable. 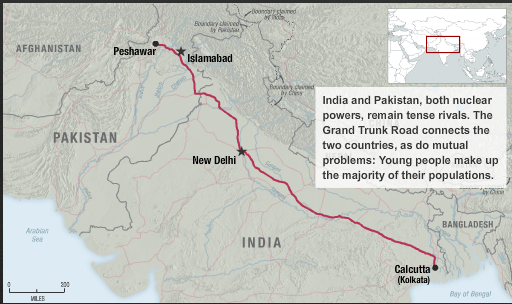 NPR (National Public Radio)’s Morning Edition just started broadcasting a really fantastic series on the Grand Trunk Road, which stretches across the subcontinent from the Bay of Bengal to the Hindu Kush mountains. 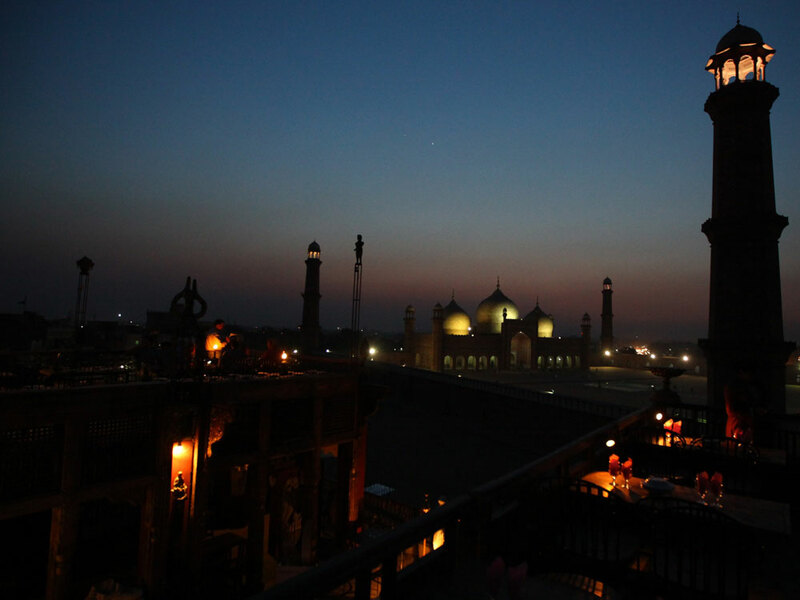 It is one of South Asia’s oldest and most historic highways, ultimately linking India and Pakistan together, and NPR correspondents are making the journey and delivering interesting news reports along the way. According to Morning Edition‘s Steve Inskeep, who joined the team in Pakistan for the second part of the series (the first part traveled GT Road in India), “a new generation is growing up along the ancient road” and the show aims to tell the stories of those young Indians and Pakistans, their opportunities and their problems. They [youth] fall into three broad categories – there’s an enormous body of optimism… who are very well-positioned to inherit this new wealth [in India]…then there’s another lot who are still very much filled with hope that they can get something out of society…to lift themselves and their family out of that position. And then there’s a third grouping who have pretty much given up hope, particularly in rural areas…when you go through that great stretch in north India, which hasn’t changed much over the years, you do meet people there, at age 21 or 22, who have already abandoned any hope that they’re going to get out of their situation. But they are investing in their children. The consumers of this narrative represent the largest demographic slice of Pakistan – young, urban men and women under the age of 30. They came of age under a military dictatorship with a war on their borders, and, more recently, almost daily terrorist attacks in their major cities. The twin poles of their civic identity – Pakistan and Islam – are under immense stress. They love Pakistan; they want to take Islam back from the jihadists. But there is no national dialogue, and no vision for the state: no place, in other words, where the young can make sense of their own country. Pakistan is ideologically adrift and headed toward incoherence, unable to articulate its own meaning as either a state or a nation. The debate therefore, is arguably less of a polarized and hard divide, and more of an existential crisis of identity – reflecting a question our leaders have failed to cohesively address and answer – What is Pakistan? This vacuum is dangerous because it leads to extremes on both side of the spectrum who refuse to engage with one another, which in turn exacerbates the issue. In speaking to youth in both India and Pakistan, NPR is aiming to at least initiate this conversation, which is commendable. It also aims to show how issues on both sides of the border further emphasize our similarities, rather than our differences. Definitely a great series to check out, if nothing else. Last year, T-Mobile UK debuted a commercial that featured 400 dancers at Liverpool Street Station. The ad, which has been seen over 19 million times on YouTube, even led to a Facebook-organized knock-off flash mob that shut down the same station a month later. Flash mobs have been occurring since 2003, using new media tools to not only organize crowds, but also to foster viral online sensations. The flash dance strategy, as used by companies T-Mobile and now Coke, is therefore a pretty savvy marketing tool because it’s using the universal appeal of dance to target and engage audiences. In the case of Coke, the kids are dancing to a catchy commercial jingle, that will at the very least catch your attention (if you’re a non-Grinch, it’ll make you smile). Even if you don’t drink Coke, you’d probably walk away humming the tune. At least I did.